My message: Who you are BEING when you connect matters more than being connected 24/7 or any time. Remember the movie The Matrix? (1999). 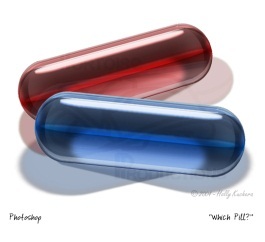 Computer programmer, alias “Neo”, doubles as a hacker driven to learn the meaning of the “Matrix.” Neo meets Morpheus, chooses to take the red (not blue) pill and wakes up in a liquid-filled vessel as part of the human battery making electricity for the machines that are generating the “matrix” that humans live in and think is real. Which pill would you swallow? The choice — and it is a choice — is between the blissful ignorance of illusion (blue) and embracing the sometimes painful truth of reality (red). Which world will help you lead your team? Contribute to your family? Which reality will support achieving your commitments that really matter, the ones worth pursuing regardless of the outcome? I spoke at SIPACON 2012: Always On, Always Connected – New Era of Connectivity. My communication workshop was entitled: As technology advances, so must your leadership & communication skills. The attendees were investors, programmers, hardware and software designers, makers of video games, entrepreneurs, inventors of augmented reality and making texting possible for the illiterate. They spoke of terabytes, zettabytes (Google it, I had to) and how 72 hours of media is being uploaded to the internet every minute. Yes, I was addressing the matrix-makers themselves. As committed and dedicated as they are to building the matrix with their genius that lets us connect to each other around the world, under the sea and over the stars, they readily admitted that their technical expertise doesn’t help them when it comes to dealing with people. While they could create a mobile device that sends your medical history to the ER before you arrive in the ambulance, they did not have a technology that helped them resolve team conflict, grumpy bosses or figuring out the next step in their career. People with a “commanding” style of decision making (I’ll make the decision now!) prefer to hear the bottom line first, then the details. People with the “commanding” style can steamroller the “collaborative” people, negating their valuable insights (“Let’s gather different views to make the best decision.”). In that moment, it was clear to me he’d taken the red pill. Maybe he had to swallow a handful because the crowd around me didn’t clear for a good 20 minutes. He was willing to be vulnerable with someone he didn’t know, and even better and more courageous, with someone who didn’t exhibit his preferred style. He didn’t let his preference which includes being guarded and holding back stop him. His courage demonstrated the power of choosing to risk stepping out of our comfort zone. You are your own “the One”. You can chose the pill that unplugs you from the 24/7 matrix so you can connect with yourself first, then others. I think you’ll find it the best reality of them all.